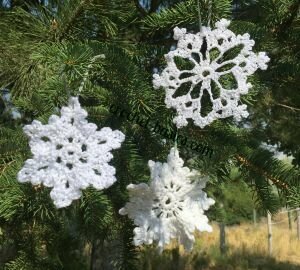 Crochet snowflakes are absolutely beautiful. They will add a nice, wintery touch to your decorations, whether they’re hanging on your Christmas tree or lying on your table as a coaster. My snowflakes hang around through January with my snowmen for winter decorations, too. They’re so fun and for the most part, really simple to make. There are an endless number of crochet snowflake patterns out there. 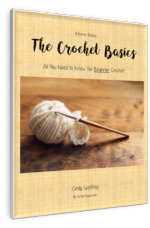 Most are easy and straight forward, but, like anything else you’ll find those few that are more complicated for the more advanced crocheter. Check the pattern first. It should tell you what level or difficulty it is. If it doesn’t, read through the instructions and make sure you understand what they mean. 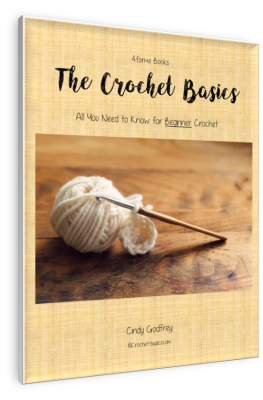 If you want to learn how to crochet a snowflake, though, this is the place! I’ll walk you through this beginner pattern step-by-step. Soon you’ll be making lots of these little gems for your family and friends, I’m sure of it! In my pictures, I used white-silver, Red Heart Holiday yarn with a size H hook. 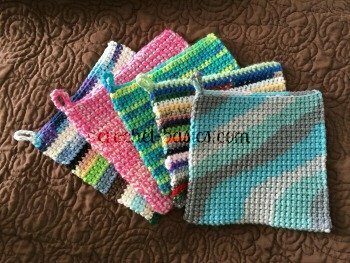 You can use whatever yarn you would like with whatever size hook you want to get your desired size and look. I’m going to suggest you start with the following. Then if you want to make changes to your next one or two, go for it! There really is no gauge for this, but ideally you want the finished crochet snowflake to be about 4”- 5”. So, adjust your hook accordingly. Join with ss to 1st chain to form a ring. I always put a stitch marker in my 1st sc. That way I always know where my round started. Crochet Snowflake Help . . .
You may need to push the single crochets around the ring for them all to fit on the ring. You should have 6 ch-3 spaces. There should be 6 "points" around your snowflake. There you have it a wonderful snowflake that was super easy to make! Now go make more crochet snowflakes and decorate your whole house! You could even add them to your gifts this year as a little added bonus. To keep you going here are a few more patterns you could try.